Sit back in a hammock by the lake, or walk around and find turtles and ducks. With three poolside jungle gyms and a lazy river, kids can play for days. When you just need a quiet place for laps, head to the indoor pool. Plenty of light and warm colors make a welcoming home base for your family. Whether it's a quick game or a whole match, the resort's tennis courts are where it's at. The mini golf course is a great place for a little friendly competition with the family. There's fun lazy river, shuffleboard, and putt-putt golf, all by the pool. Go for a swim without facing the cold – there's an indoor pool! 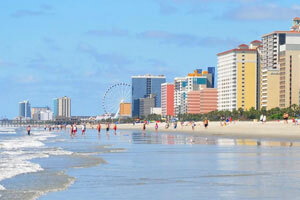 Sheraton Broadway Plantation Resort Villas is located in the heart of Myrtle Beach. After dropping off your luggage in your condo, get changed into swimsuits, grab pool toys and water wings, apply sunscreen and get ready to be amazed. There’s an indoor pool, outdoor pool and a children’s pool along with a lazy river. But that’s not all! The seasonal on-site children's waterpark has a giant pirate ship and is sure to be a big hit with the little ones. Grab a bite to eat at the seasonal Poolside Bar & Grill, or take advantage of the outdoor bbq grills and have a family cookout. The kids can assist by carrying burgers, hot dogs and side-dishes. Then lay out the condiments and toppings and let everyone have at it. Basketball and Tennis lovers will enjoy the onsite courts. Get in a workout at the on-site fitness center while the kids are occupied on the on-site playground. Meet up afterward for a round of mini-golf: grown-ups vs. kids. One- and two-bedroom condos sleep four to eight guests. Full kitchens have everything you need to make and serve meals. Bring the kids along to the Piggly Wiggly Grocery Store to make sure that no one’s favorites are forgotten. When you return, ask the kids to help bake your famous double chocolate brownies (not that they’ll need convincing). You’ll be thankful for the in-suite washer/dryer when the kids are covered in chocolate. Up for a low-key night in? Flatscreen TVs with Cable have you covered. Gather everyone on the couch, put one of the kids in charge of the remote and another on snack duty and get ready to be entertained. Be sure to pack some of your favorite movies from home, DVD players are perfect for family movie night. Sheraton Broadway Plantation Resort Villas is a short drive to Broadway at the Beach. Go for a ride on the SkyWheel. At almost two-hundred feet tall, it’s an exciting adventure that everyone in the family can experience together. Fans of the Believe It or Not cartoons won’t want to miss Ripley’s Odditorium, the home of Robert Ripley’s personal collection of strange and unusual artifacts. See an authentic shrunken head and check how you measure up against the World’s Tallest Man. The Children’s Museum of South Carolina features several interactive exhibits that allow children to use their imagination and learn all at the same time. Shopaholics, rejoice! The resort is just fifteen minutes to the Tanger Outlets Myrtle Beach. Brands include Calvin Klein, Coach, J.Crew and Kate Spade New York. Surprise the kids with a stop at Ben & Jerry’s for ice cream and get your coffee fix at Starbucks. - Splash Cove and the pool bar at the resort are open seasonally. Splash Cove closes after Labor Day and the pool bar closes at the end of September. Both reopen by May (weather permitting). Not all condos may be able to accommodate rollaway beds or cribs. Please contact the resort directly for more information.